If there is anything new in Thailand, it is well hidden. Everything from the streets to the buildings, even the people and plants are weathered and worn. Everything seems to have a story of its own to tell, everything seems to possess an ancient knowledge which, if you if you don’t search hard enough for, you wouldn’t know existed. In the United States, everything has an expiration date and we value anything new, upgraded, modernized, cutting-edge, or youthful. In Thailand, what is most sacred is what is ancient, totemic, wise, and enduring. There is pride and dignity in being worn from labor and wizened, and in what has been allowed to mature and take root. There is a patience inherent in Thai culture which may well be the envy of many an American who scarcely has a moment to stop and smell the flowers, let alone cultivate and watch them grow. The most beautiful places are those which would probably have long since been bulldozed, remodeled, recycled, or otherwise abandoned and forgotten in many other “modern” societies. 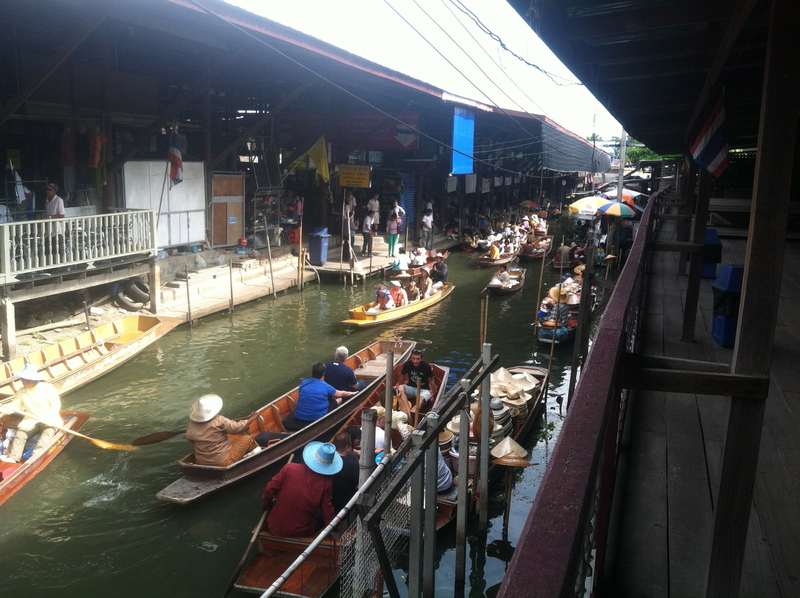 The Damnoen Saduak Floating Market is one such place. Here, the “old way” is the only way. Instead of roads, miles of canals stretch and wind about like the arteries of an enormous organism connecting the vital organs: temples, homes, marketplaces, and communal gathering areas. Boats, not cars, meander relaxedly here and there, their occupants taking fresh produce to market, visiting the temple, or even cooking meals over fires built right in the boat. Others come down to the murky waters to bathe themselves or wash their clothes. We visited the market on our first morning in Thailand. When we arrived, the village hadn’t yet fully awakened except for the dock welcoming tourists with a line of longboats and a local who took everyone’s picture as they floated past (then tried to sell everyone their picture which had been printed on a small decorative plate as they got off of the boat). Our tour took us through the neighborhood, past homes and gardens, a local temple (complete with the first giant Buddha of the trip! ), a marketplace, and even a small tourist resort which, although constructed to resemble the surrounding Thai architecture, was glaringly out of place with amenities such as mowed grass, arcadia doors, and porch lights. Before most of the people had started their day, a few village dogs and chickens wandered around scrounging for food and water. As we made our way through the waterway the village came to life bit by bit. By the time we reached the heart of the area, the marketplace, it was bustling. 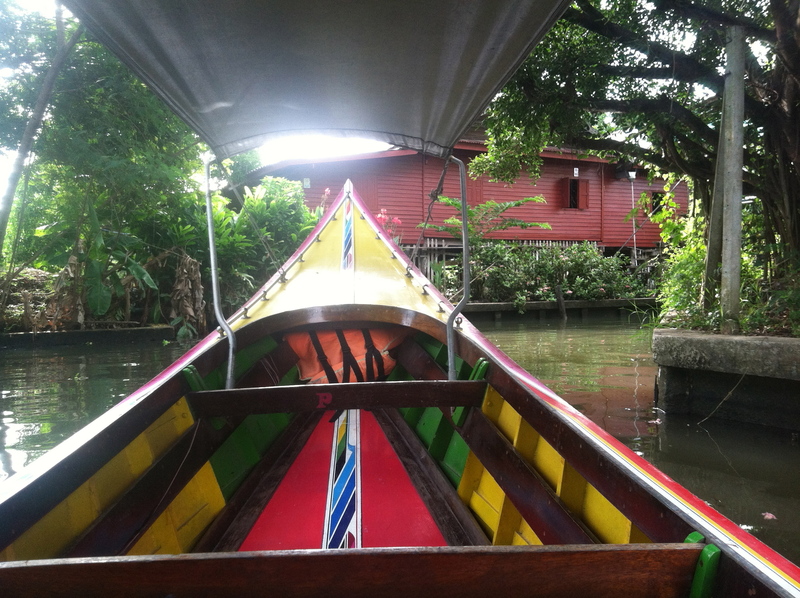 Brightly-painted longboats clogged the channels, piloted by locals peddling their goods: fruits, vegetables, flowers, trinkets. Street merchants lined both sides of the canals with their treasures spread out around them, luring anyone who passed by in for a sale. Tourists and their guides haggled back and forth in broken English and Thai. We wandered around, a bit overwhelmed by this foreign method of commerce and wary, having been warned that the merchants are renowned for taking advantage of unknowing tourists by overcharging. The trick, we discovered, is not to appear too desperate. Once you start to walk away, the seller’s guard falls and he or she will typically accept a much lower price than originally asked for. Neither of us were too eager to spend much money, though, and settled for just a few small trinkets each–Kevin bought some decorative masks and I purchased a hanging Buddha face. Even having been warned, we both later realized we had overpaid. We zig-zagged through the marketplace, admiring the sheer vastness of the place. Floor to ceiling was covered in bright fabrics, artwork, decorative figurines, vases, oils and incense, food, or jewelry. It was difficult to squeeze through the narrow walkways, too crowded with people and merchandise. The thick, humid air caused our shirts to cling tightly to our skin and was filled with the aroma of a thousand kinds of exotic food. We couldn’t leave without tasting some of it! Our guide purchased us a few varieties of the strangest looking fruit I’ve ever seen along with some deep fried bananas (delicious!). My favorite thing about Thailand, and about Damnoen Saduak, was that it was so different from everything I am accustomed to. It felt more like stepping into another time than it did like stepping into another place. It helped me realize how wonderful and scary our modern, interconnected, fast-paced lives can be, and how wonderful and (surprisingly) beautiful a more traditional, remote, lifestyle can be. It’s not better or worse, just different. With each new day, new inventions and discoveries are transforming the fabric of our existence, but equally remarkable is how powerful and ever-present our history is, and though it is long since past, how much it can still teach us.